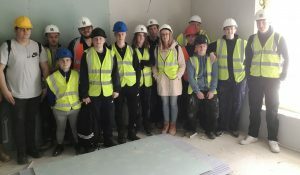 A group of Dundee and Angus College construction students recently had the opportunity to see a development in action, with a site visit to Hillcrest’s Eliza Street construction project. The students were from the NPA Award in Construction (Multi-Trade) class, which teaches skills in a range of trades including joinery, bricklaying and painting and decorating. This outing, which was overseen by Hillcrest’s Clerk of Works Craig Blair, gave the students the opportunity to visit a live development and chat to some of the tradesmen involved. Course Lecturer Euan Macpherson of Dundee and Angus College, said: “Come next summer, some of the students will be looking for work, while others may be continuing on to further courses. The Eliza Street development is nearing completion, and will see 40 affordable houses handed over in the Stobswell area of Dundee.